GearHost Review 2019: Is GearHost a Good Hosting? GearHost specializes in providing quality web hosting to .NET and PHP developers, making it fast and easy for them to deploy applications and websites at an affordable cost. Their cloud-based hosting service means that the usual performance bottlenecks and service outages are eliminated, and applications run four times faster than on a typical shared host. Ryan Kekos, founder of GearHost, first launched the web hosting service in 2000, running it out of his mother’s basement. Since then, the company’s expanded a fair bit and now serves a global customer base. The company is based in Denver, Colorado, and specializes in providing entry-level cloud hosting for both businesses and individuals. They have four datacenters in the United States, located in Denver, Irvine, Chicago, and Ashburn. GearHost’smain focus is to make it quickand easy for developers to deploy cloud-based applications and websites at an affordable cost. Their cloud-based hosting model means that the usual performance bottlenecks and service outages are eliminated, and applications run four times faster than on a typical shared host. As they’re a developer-focused hosting service, they offer full support for the latest versions of scripting languages and frameworks, along with servers specifically optimized for the additional load. Plus, if at any time you require more resources, you can acquire them with a single click through their minimalistic, easy-to-use admin interface. Along with the typical web hosting features such as a one-click app installer, GearHost also has a few value-added features like two-factor authentication, live app monitoring, Git publishing, and a DNS manager. GearHost also boasts an impressive 99.99% uptime Service-Level Agreement (SLA). If there’s any drop in service below this rate, it will be refunded to your account at the hourly rate incurred. One of the perks of GearHost is that plans are billed by the hour, up to a 672-hour cap (28 days). You’re only billed for the number of hours you use your CloudSite, and even if you use it for more than 672 hours that month, you’ll only be charged for those 672 hours. Plus, your CloudSite is fully scalable: if you need more resources at any time, you can change your billing plan directly from the interface without any disruption to your service. 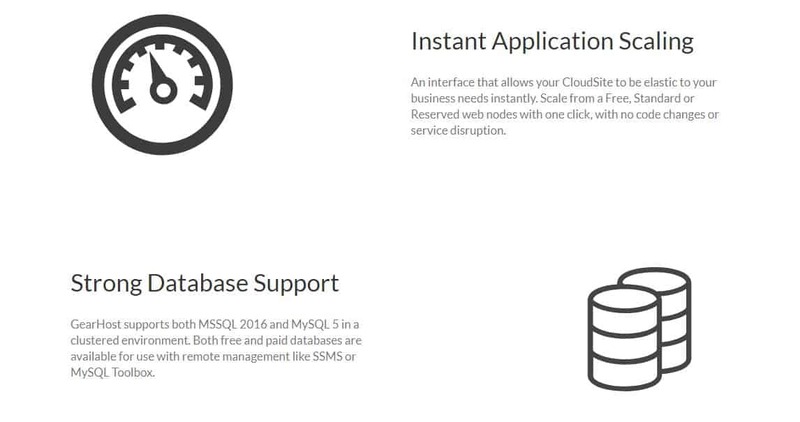 GearHost offers a free plan for its users to experiment with .NET and PHP cloud applications. You can create up to five CloudSites and five databases without a credit card – with a credit card on file, this cap is increased to 10 CloudSites and 10 databases. This is sufficient if you’re simply testing out a few websites in development phase, but the restrictions on storage, CPU usage, and bandwidth seem rather heavy compared to other free hosting options in the market. There is also no money back guarantee. Additionally, their dedication to customer support seems to have faltered over the years. GearHost was initially known for its first-rate24/7 customer support – you could reach them via social media, telephone, or email, and you’d be connected to a helpful and knowledgeable representative who would go above and beyond to resolve your queries. Now, though, their main support channels are email, a support ticket system, or a toll-free number only available during regular U.S. business hours. This may prove problematic for users in other countries; when I tried their support ticket system, I only got a response the next working day. That said, they do have a database of help documentation and answers to FAQs on their website, so users can easily diagnose their own technical issues if necessary. onClick="trackClickout('event', 'clickout', 'Vendor Page - Visit User Reviews', 'GearHost', this, true);"
Due to something the engineers at Gearhost did, I lost all my information and months of work, these cost me a lot of money, due to contracts cancelled by my clients and lots of time of work. They never solved the issue and ever since (Mar-14-2018) I have not gotten access to the server I originally contracted, I never heard back from them ever since. Last month, I realized that I have been charged the monthly fee for a service I have not received, I sent several emails asking for a refund and they will state that their policy prevents them from issuing a refund. even though they know and admitted that no service has been provided. I just received an eMail from them (Sep 27) asking me to activate my account (which is admitting that my account has not been active since the problem arouse (back in March 2018). As a developer-focused cloud hosting service, GearHost offers several advantages compared to traditional shared hosting services. However, they may be best suited to individual developers and small businesses rather than larger enterprises. Wondering how GearHost stacks up against other Web Hosting companies? Enter any other Web Hosting company and we will give you a side-by-side comparison.